I am editing this after effects template. Two flares are there in the package as two separate videos. How do I use them in the video? When I add like this, it shows only the flare without background video. Thank you. It's because the template you're using is referencing video files, or still images - the Lens Flare effect, which do not use an alpha channel. This was likely done deliberatly by the template author to prevent bloating the template file size, especially if it's a motion/video file. 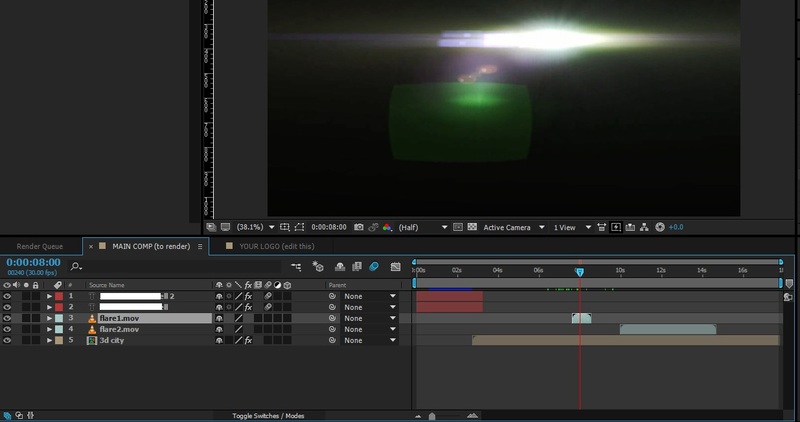 A video flare that moves, using an alpha channel would be huge in size depending on resolution and length. The work around is you need to set the layer's Blending Mode to a setting other than Normal. Normal will simply place the file as is... what you are now seeing. Black with Flare, nothing underneath. You will get different results with different Modes. Typically for flares, I'd use either Screen, Soft Light, Hard Light, or Multiply. You may get interesting effects with other options such as Vivid Light. But these modes will essentially matte out areas, depending on setting, to get a superimposed effect of the flare over underlying layers. Not the answer you're looking for? Browse other questions tagged after-effects video-editor effects special-effects visual-effects or ask your own question. How to make interactive video presentation? After Effects rendering wrong colors? How to slow down a typography effect in after effects?